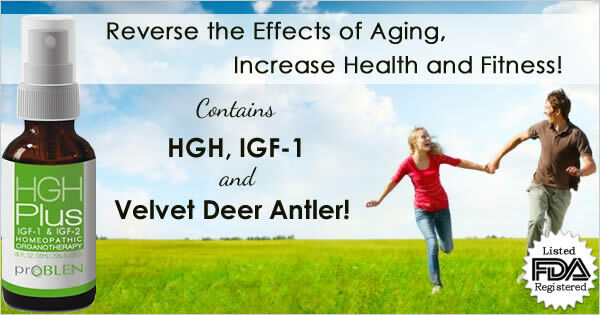 Deer Antler Velvet - A Major Ingredient in HGH Plus IGF-1 & IGF-2! An important part of the HGH Plus IGF-1 & IGF-2 formulation is deer antler velvet, also called velvet deer antler. Deer antler velvet has been used for its known longevity and fitness benefits as far back as ancient China. In 1988 Dr. B.X. Wang, et al., studied and documented the effects of velvet antler on anti-aging. More recent studies have confirmed these anti-aging findings. Antler velvet has been found to enhance body systems and improve the functioning of bones, nerves, muscles, blood vessels, lungs, the endocrine organs, the lymphatic system, and the brain. It has also been widely used for its athletic and bodybuilding benefits for decades in Europe and Russia. A Superior Source of Growth Factors! Deer antler velvet has been called a natural steroid although it is not a steroid. It is a natural and safe substance that is capable of promoting strength and endurance, improving muscle recovery after exercise, enhancing sexual function, as well as providing a wide range of other health benefits. Velvet antler contains almost 40 health components, including 9 growth factors as well as at least 18 amino acids. It is also rich in collagen type 2, glucosamine and chondroitin. Clinical studies have shown that deer antler velvet is the richest source of diverse growth factors in the animal kingdom. One of Nature's Best Natural Ingredients! Deer antler velvet is a natural supplement compounded when deer antler velvet is harvested for nutritional and medicinal use. Each year male deer cast off their previous year's antler growth and in the spring a new cycle of bony antler growth begins at an extremely rapid rate, making deer antlers the fastest growing bony substance in existence. Used in supplements deer antler velvet is known as one of the most full-spectrum health, fitness, and anti-aging ingredients available. Velvet antler is also considered very safe. Dr. Stephen Center, MD, a prominent anti-aging physician and author of the book Velvet Deer Antler: Nature's Anti-Aging Solution breaks down the many benefits of deer antler velvet into 5 Areas. The history of deer antler velvet as a medicinal substance for treating ailments such as low energy, headaches, joint pain, kidney and liver problems, stomach ulcers, gout, eczema, chills, dizziness, insomnia, amnesia, impotence, abnormal menstruation, dysfunctional uterine bleeding, wounds,and more stretches back thousands of years to the Han Dynasty 206 BC to 220 AD. Antler velvet has been a staple of Traditional Chinese Medicine for more than 2,000 years as a wellness tonic to strengthen bones and tendons, nourish the blood, reduce swelling, and treat impotence. It is mentioned in the chief authority on early Chinese pharmacology, the Pen Ts'ao Kang Mu. Several modern compilations of Chinese medical preparations still contain numerous antler uses, and antler extract compounds are listed in the pharmacopoeia of the former USSR Health Ministry. The sexual benefits of antler velvet are well known in Eastern medicine with it being in continuous use in Asia for millennia. It is the most revered aphrodisiac used in traditional Chinese medicine. VDA has been used by athletes throughout the world for many decades for its safe athletic and performance enhancing benefits and it is still being used today more than ever. Throughout the world today deer antler velvet is also still used in patients suffering from a wide range of health conditions. Although traditional Chinese medicine has extolled the benefits of velvet antler as a premium medicinal substance for 2000 years recent studies provide compelling scientific evidence supporting its use to relieve a range of symptoms. Research has shown deer antler velvet to provide beneficial effects in many areas including anti-aging, musculoskeletal, cardiovascular, mental, immune system, healing, and growth and strength enhancement. A Russian study indicated that the amino acids, polypeptides and other compounds found in antler increased the survival rate of mice with cancerous tumors up to 40%. In addition, a study conducted by the East-West Research Institute and the Korean FDA found that mice with tumors lost less weight and suffered lower levels of kidney damage than those treated with the frequently-prescribed anti-cancer drug cis -Platin (CDDP). 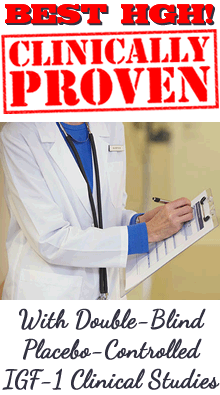 It also appeared to boost the effectiveness of CDDP when used with the cancer drug. Those mice given a combination of velvet antler extract and CDDP survived longer and had fewer side effects than those given CDDP alone. Another study noted that it appears to increase neutrophil levels in mice, which boost the body's ability to fight injuries and disease. A New Zealand study found compelling evidence that extracts of antler velvet stimulated the human immune system, as measured by increased white blood cell production. 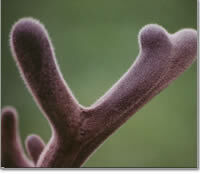 Although use of the deer antler velvet extract pantocrin during World War II by Russian physicians provides anecdotal evidence of its healing powers, more recent studies have found that it can help heal epidermal wounds, speed recovery of surgical patients, ease the effects of menopause in women, increase testosterone levels in men, and can help to prevent conditions associated with aging. Several studies show a positive correlation between consistent use of deer antler velvet and cardiovascular health. Human subjects who used it were able to endure larger work loads and experienced a shorter recovery time between exercises. One study suggested that daily use of chondroitin sulfate A - a key element of velvet antler - can reduce the risk of fatal heart attacks and stroke by more than 400 percent. 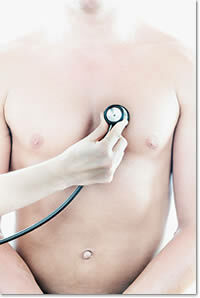 Many participants with high or low blood pressure also showed improvements in blood pressure. Other studies reported an increase in heart strength and volume of blood pumped, while cardiac output, heart rate, mean arterial pressure, pulse pressure, central venous pressure and other parameters remained unchanged. Researchers suggest that the polysaccharides in antler may reduce the blood's tendency to clot, improving circulation, decreasing stroke risk and boosting general cardiovascular health. Russian and Japanese researchers have concentrated on an alcohol extract of velvet antler called Pantocrin or Rantarin, discovering that the extract appears to lower blood pressure in both human subjects and laboratory animals. Additional studies indicate that velvet antler significantly lowered the cholesterol level in laboratory animals. Elk antler grows as much as 50 pounds in less than a few months, making it the fastest-developing animal organism in the world. This rapid development is caused by the antler's high content of bone morphogenetic proteins, which regulate bone growth, as well as growth factors I and II (IGF-1 & IGF-2). These growth factors increase the rate of cell division during antler development, and contribute to the medicinal and anti-aging effects of velvet antler. A study conducted by Suttie and Haines found that animals fed high levels of velvet antler extract grew significantly faster than the control group. These animals also experienced increased liver weight and a higher bone calcium content. In addition, the researchers found that velvet antler appeared to decrease calcium excretion. In another study researchers reported observing new bone formation following whiplash injuries in rabbits. Osteoarthritis is caused by the loss of cartilage in bone joints. In normal joints, cartilage serves as a buffer between bones. Usually the body replenishes cartilage as it wears away, but when osteoarthritis occurs, cartilage deteriorates faster than the body can replace it. Eventually, the bones begin to rub together causing pain, swelling and loss of joint mobility. Most treatments for osteoarthritis attempt to reduce pain and maintain joint function but these treatments do little to restore joint health. In fact, many prescription and over-the-counter non-steroidal anti-inflammatory drugs actually prevent the growth of collagen in joints, causing further cartilage degeneration. These drugs can also produce other serious side effects such as deterioration of the gastrointestinal tract lining, and liver and kidney damage. Researchers believe that the imbalance between cartilage erosion and regeneration in osteoarthritis sufferers is caused by a lack of glycosaminoglycans. Recent clinical tests suggest oral ingestion of glycosaminoglycan-peptide complex, or components such as chondroitin sulfate and glucosamine sulfate - both found in deer antler velvet - may help stimulate cartilage repair. Chondroitin sulfate, the most abundant glycosaminoglycan found in velvet antler, is used in surgery to stabilize tissue. Several studies on humans indicate regular oral ingestion of chondroitin sulfate can significantly reduce the symptoms associated with osteoarthritis. Randomized studies of glucosamine indicate the compound not only inhibits cartilage degradation but also helps repair damaged cartilage. Previous studies have already suggested that the cartilage compounds found in velvet antler may be effective at relieving rheumatoid arthritis pain. Clinical studies indicate that deer antler velvet may also function as an antidepressant and mood regulator. It was found to inhibit monoamine oxidase activity in the liver and brain tissues of aged mice. Monoamine-oxidase inhibitors prevent the breakdown of monoamine neurotransmitters such as norepinephrine and serotonin. Antler apparently allows these vital neurotransmitters to be available longer to the brain structure, enhancing mood. A study by a Russian scientist showed that the mental capacity of young men improved significantly following the administration of deer antler velvet. Our HGH Plus IGF-1 & IGF-2 product is the most comprehensive HGH product available! It contains HGH, IGF-1, IGF-2, deer antler velvet, and alpha GPC. It also contains pituitary extract to nourish and aid the pituitary gland and liver extract to nourish and aid the liver. You get all these ingredients in optimum amounts and all in the same FDA registered homeopathic product! Bodybuilding and athletes take HGH Plus IGF-1 & IGF-2!